As a therapist, I know more than anyone how developmental milestones can be a stress point for new moms. I worried a lot with my first child and tried diligently to make sure he met all his milestones on time. With my second, however, I was much more relaxed. I knew she would reach them on her own time frame. Every child is uniquely made. While he/she may excel in one area, they might struggle with another set of skills. That's the way we all are, isn't it? Wired to have strengths and weaknesses? Interests, passions and then those things you couldn't care less about? 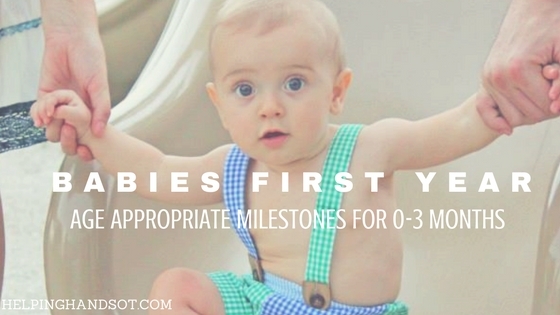 I get asked a lot of questions from friends about milestones and what is normal for each age. I thought it would be helpful for those parents or caregivers out there to have a G U I D E L I N E for general milestones for each age group. But please, use it just as that. Don't stress yourself out if your child is a little behind in one area. That is okay! Let them develop when they are ready by learning through play. However, if you see that your child is quite behind in one or more areas (gross motor skills, visual motor + perceptual skills, and fine motor skills) then talk to your pediatrician about your concerns. Maybe there is something going on that needs a little more investigation. So enjoy! Pass this along to friends and send me any questions or concerns you may have. Tummy time or what we call the prone position is one of the most important positions in which babies begin to learn anti-gravity movements. While it doesn't always tend to be babies favorite past time, there are so many easy ways to make tummy time more fun. See my previous post The Importance of Tummy Time & How to Make it Less Miserable for some helpful tummy time hints! If your child cannot yet lift their head up against gravity, be sure to supervise them at all times while in this position. But don't let your worries rob your child of this important developmental position. It is truly the basis for all gross motor and fine motor developmental skills. Though tummy time gets all the spotlight (for good reason), there are some important developmental skills your baby is learning while on their back too! I would just advise caution against letting baby spend too much time on their back and especially in car-seats the first few months to avoid plagiocephaly deformities and torticollis. At birth, babies' eyes and visual systems aren't fully developed. In fact, the visual system is one of the last systems to develop. Significant development occurs within the first few months of life as the eyes begin to work together and visually track and focus on objects and faces. Fine motor and grasp development begins rather slowly, especially within the first three months. During this time period, primitive reflexes override babies ability to really use their hands much and their hands are mostly in a fisted position. The fisted posture of the hands (called a palmar reflex) should begin to go away around 4-6 months of age and this is when baby begins to volitionally reach for and grab objects. Within the first two months of life, a deep latch (for breastfed babies) should begin to emerge and by 3 months, it should be established. Talk to a lactation consultant if baby is having difficulty breastfeeding and be sure to check for tongue ties. There are a lot of nursing positions that make deep latch easier for newborns.